Choose. Or have them all. The laddus are delicious. I love them, they are conveniently packed and may be easily transported to any distance without injury. Try them!. This is my sincere recommendation. It should also be mentioned that they were promptly delivered. Many thanks to the producers and Management! Each bite is flavourful and it is so good! Makes a great healthy snack for when you are on the go! I got the Dry fruit laddus delivered to office. 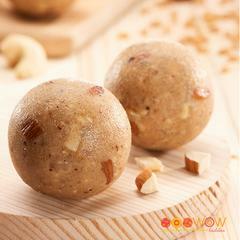 Believe me, I have been travelling across country on roads and have tasted laddus all over.. But these laddus are something totally different. Perfect blend of taste and texture. One can not be enough. I had to save one box from every one so that I could take it home, Only on the condition that I order one box each for all of them in office. Further I should mention about Wheat Laddus....... wonderful taste and health packed in one..... exactly same as what my mom had perfected art of making those laddus. 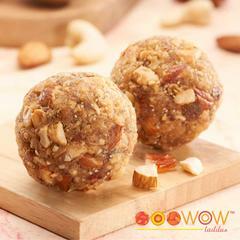 I confide, I am an addict of wow laddus by now and get restless if stock goes below 2 boxes. 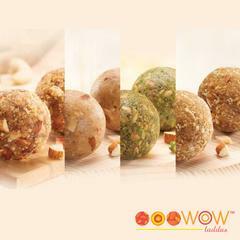 With 1st bite of the Ladoo its natural for anyone to come out with expression "WOW!! 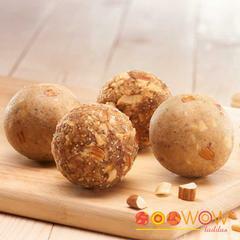 ", their dry fruit Ladoos are to die for, very rich in ingredients, healthy and it tingles all the right notes in your palette. But my favourite is their Wheat Ladoo, the very 1st bite I had it transported me back to Punjab of 80s, it has a typical taste & aroma of Punjabi Panjiri which our Mothers use to make while we were growing up in 80s & 90s, this will hit right chords with Punjabis specially, its a Nostalgic Ladoo. Me and my brother enjoyed your laddus thoroughly. Their taste was extremely fulfilling and had the perfect amount of ingredients which gave it a new blend and made it crunchy. Every time the laddus come to our place there is a fight among everyone in the house for them. Thanks for very tasty laddus! Laddus were really tasty and got delivered fine as well in the package... Those were like treasure Laddus... :) all the time with every bite we were trying to figure out the contents... But couldn't find all... But all together the taste was very good!